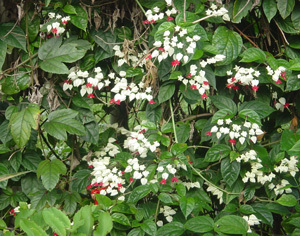 Bleeding Heart Vine (Clerodendrum thomsoniae) grows as a vine rather than a bush like the other varieties of Clerodendrum. The name comes from the clusters of white or pink heart shaped bracts with red petals beneath each heart. Propagate from cuttings, seeds or runners. The runners are easily controlled. Also known as Scarlet Kiss. It's able to withstand light freezing, although it might die back to the roots, requiring it to start over the following spring. It blooms best in full sun to part shade, with rich soil free from nematodes. It is not salt tolerant. This striking plant comes from west Africa.